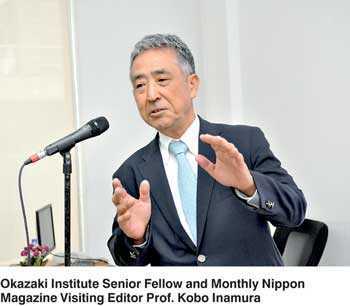 Japanese expertProfessor Kobo Inamura recently spoke on the ‘Kokutai No Hongi’ method which translates to the harmony and spirit in the cardinal principles of the country’s values and morality. Ministry of Posts and Telecommunications International Cooperation Director and visiting professor of international programs at the National Suitama University Tokyo Professor Kobo Inamura gave the inspirational lecture based on the disciplines surrounding the national entity of Japan, one of the most sought-after business management practices in the world. With expertise derived from many years of experience in working with leading corporate bodies in the country he was able to deliver key insights to the success of the communal economy of Japan. Inamura, speaking on harmony and spirit that is inherent in the cardinal principles of Japanese values and morality that makes up the character of Japan’s hardworking and dedicated workforce, said that the Japanese always have the team concept in their minds as they work together in a company. He went on to say that the secret behind the Japanese working harmoniously with one another is the theory of ‘Ishin Denshin’, which is a Japanese idiom which denotes a form of interpersonal communication through unspoken mutual understanding and is often rendered as heart to heart communication. The professor stressed on the fact that everybody should work in unison and with passion in order to improvement a state. “It is possible to see a healthy development in the people’s economic life only where every single person put their heart and soul into their respective occupations, and there is coherence or order in each of their activities, with their minds set on guarding and maintaining the prosperity of their state,” he said. He said that the most successful business leaders in the world are positive-thinkers. The professor further explained that another reason behind the successful corporate sector in Japan is that they take their time when opening up a business because they usually deliberate over the surrounding, the relationship with the customers and process the trust before starting up the business. Inamura also spoke on the origin of the Japanese civilisation and language in order to bring out how basic ethics of the Japanese culture was formed. The concept of Kokutai, or the National Polity, emerged and developed in the course of Japanese modernisation. The National Polity was the principal code that reinforced the spiritual authority and sovereignty of the Japanese Emperor (Tennō), and played an ideological role during the Asia Pacific War. The professor’s lecture was based on ‘Kokutai No Hongi’, a theory book which was first published by the Japanese government in 1937, and has been likened to Mein Kampf in that it officially dictated the peculiar national disciplines of the Japanese for the pre-war and war years. Visiting Sri Lanka for the first time, Inamura is known as an 1880’s Meiji Era bureaucrat – well trained, tough-minded and with a solid understanding of international relations. His interactive lectures have been internationally acclaimed as examples of the Japanese spirit of business and governance. The series of guest lectures by professor Kobo Inamura was hosted by the Lanka Nippon BizTech Institute (LNBTI), Sri Lanka’s only Japanese-based technology university with the objective of helping local students become better global citizens when they enter the industry.